Ok, I am probably pushing it just a bit when I say “I published My Own Newspaper”. What I should say is that paper.li created a “newspaper” based on the people that I follow on Twitter and what they have recently tweeted. It took only a few minutes after I logged in using my Twitter account. When I open my Paper.li newspaper, The HigginsB Daily, I can easily scan the front page and see headlines from the day. Each “article” is based on the information my PLN is interested in that they have shared on Twitter. 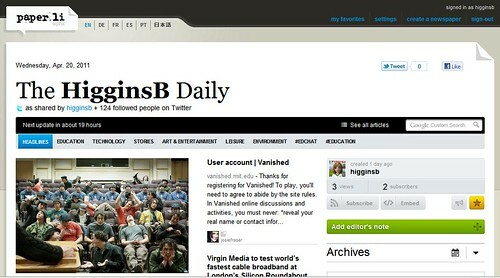 With one click, I can be reading the web content shared by the people I follow. Every article includes a small image and the username of the person that submitted that tweet so that I know who the information was shared by. The paper also includes a hashtag (#), photos, and multimedia sections and my running Twitter feed. Paper.li is a web 2.0 tool that “organizes links shared on Twitter and Facebook into an easy to read newspaper-style format.” There is another website, The Tweeted Times, that creates a personalized newspaper in the same way but what makes Paper.li so nice is how it organizes and categorizes the content. Cool features: users can read anyone’s Paper.li newspaper from anyone that has created one or they can create a paper based on other Twitter or Facebook users. Paper.li newspapers can be set to update daily or even more frequently depending on user preferences, and Paper.li sends an email each day letting users know that there is new news to read. Some downsides: there is a bit of advertising. The people at Paper.li have to get paid somehow 🙂. Also, Paper.li can’t filter the content on the page since they are simply aggregating content based on who the user follows. Depending on what PLN members share, there may be some questionable content. Users should test the site before using it with students. Teachers, classrooms or individual students could create their own newspapers daily, weekly, or whenever and stay up to date with current events based on the “news” from their PLN. OwlDesk on YouTube has a video, Social Media Tool: PaperLi, that quickly overviews how the tool works.